First Line: Once upon a time, Lady Adelaide Mary Merrill, daughter of the Marquess of Broughton, was married to Major Rupert Charles Cressleigh Compton, hero of the Somme. Lady Adelaide Compton's husband survived World War I only to come home, party and carouse to excess, and kill himself and his mistress when he drove his car into a stone wall. Since his death, Addie has enjoyed being the lady of the manor. She's made improvements to the estate and has finally decided to begin coming out of mourning by throwing a party and having several people over for a long country house weekend. Her houseguests barely have time to arrive before someone is murdered. Detective Inspector Devenand Hunter from Scotland Yard comes to solve the crime, but Addie can't help thinking her knowledge of the people involved will prove invaluable. What she doesn't count on is even more help-- from the spirit of her deceased husband, who's been told he has to perform a few good deeds before he can move along on his journey. There's a lot to recommend this first Lady Adelaide mystery set in 1924 England. Robinson gives readers a good sense of the time period: so many women "left on the shelf" because of the hundreds of thousands of men killed in the war, people wanting to throw off gloom and misery and have fun. Anglo-Indian Inspector Devenand Hunter also shows people's attitudes toward someone of mixed race. The cast of characters is an interesting mix. The secondary characters who arrive at Compton Court seem to be pulled from the Entitled and Obnoxious bin at Harrod's, but the first string more than held my interest. I liked Addie, her voice and her spirit. I also liked the fact that she rebelled against her mother's conformity as often as possible. For example, she wears her glasses. The women of her family have weak eyesight, but Addie's the only one who'd rather see where she's going than be vain and constantly walk into the furniture. Another point in her favor? She truly cares about her servants and purchases things to make their lives more comfortable. The only way she worked my nerves was by her inability to keep her mouth shut when her husband's spirit would show up to talk at her when she's in a room with other people. Over and over again, it looked as though she was talking to thin air, and it's a wonder no one had her committed to the nearest mental health facility. Moreover, since the inspector from Scotland Yard came across her "talking to herself" most often it's surprising he believed a word she said. Speaking of the inspector, I liked his character most of all-- he has a different perspective from his time in the trenches as well as from dealing with the prejudices of others, and his parents are a constant source of amusement. The author is known for her historical romances, which made me a bit nervous, but she kept the hearts and flowers to a minimum, and the story never bogged down with too many hormone-filled longings and ponderings. 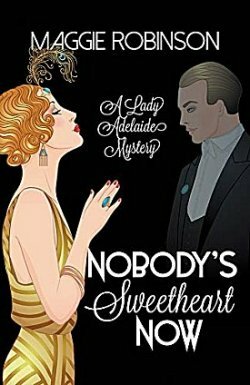 The one drawback to Nobody's Sweetheart Now is the fact that I really think the story could be just as good, if not better, by leaving the spirit of Addie's husband out completely. Other than making her look as though she's lost her mind, he has very little to do with the action. How do I feel about continuing with the series? I'll have to think about it. Addie's ghostly husband is almost a deal breaker. Hmm....I'm not much for the 'spirit showing up' plot point, Cathy. But I do like the sound of the rest of the story. And that period of time always interests me. Glad you found a lot to like about it. Yes, I liked the rest of the book. Just not sure about that ghost, though! I'm rather intrigued by the whole thing - spirit included. Will note this one down. I see it's published by the ever-wonderful PP Press. Poisoned Pen Press has so many good authors/books, don't they?